Nine miles of trails with many varied habitats offer a place to stretch muscles left stiff from hours of canoeing. The Fire Road and a section of Lassiter Trail are open to bicyclists. Merchants Millpond is heavily infested with ticks during warm weather months; be cautious while hiking. Insect repellent may help prevent a tick bite and the possibility of disease. Tuck trousers into long socks and tuck a long-sleeved shirt into pants. Check often for ticks. Wear light colors so that ticks may be easily spotted and removed. For other tips, contact park staff. 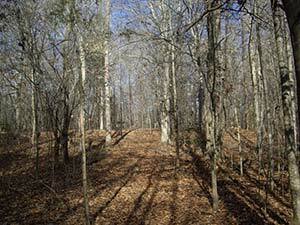 The Merchants Millpond State Park TRACK Trail follows the Coleman Trail, an easy and flat 2 mile loop. Enjoy a leisurely stroll through the forest while exploring the habitats that surround Merchants Millpond.